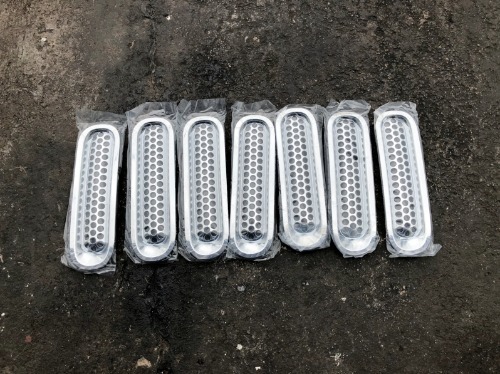 Here is a set of 7 brand new chrome mesh grill inserts. Each insert has an inlay detailed with 7mm perforations. They are molded for a precise custom fit and an easy installation with no drilling or tools required. These inserts are secured with double-side automotive grade tape. They will fit 07-18 JK and JKU but will not work 16-18 Wrangler Sahara or 17-18 Rubicon, Hard Rock or Back Country Editions with factory grill inserts. This may fit other models or years, please check your application. JK/JKU Rear Spring Spacer 1"